Oil on canvas, 39 x 57 cm. From his vantage point at Kopparhatten (the highest point in what is now the Söderåsen National Park in Sweden), Harald Foss has depicted the unspoilt and breathtaking scenery of the Skäralid rift valley in Skåne, Southern Sweden. The morning fog has evaporated over the Skärdammen lake, and the clear blue sky is reflected in its dead-calm waters. The treeline on the horizon rises in billowing formations. In the Late Romanticist spirit, the artist has used a simple light colour palette and very few horizontal line gradients, which are only sporadically broken by naked trees, to give the composition a grandiose, evocative and idyllic appearance. 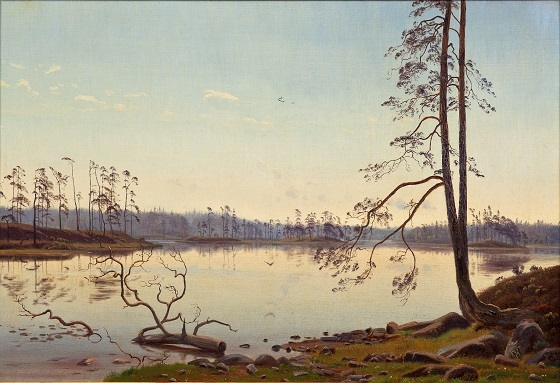 The magnificent rendition of Nordic nature also shows an influence by his former teacher Vilhelm Kyhn and his National Romanticist landscape paintings.